Quick action by Yad L'achim activists broke up an attempt to recruit Jews to missionary-sponsored religious cults in the heart of Tel Aviv. Quick action by members of the Yad L'achim anti-missionary organization broke up an attempt to recruit Jews to missionary-sponsored religious cults in the heart of Tel Aviv – outside the Azrieli Center Mall on Hashalom Street. Passerby who took a good look at the flyers and materials being distributed by several individuals outside the mall called Yad L'achim, which sent activists down to the site in order to prevent the missionaries from achieving their goals of attracting less-educated Jews to their programs. 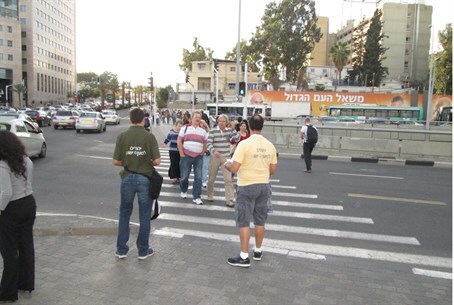 Headed by activist Binyamin Vulcan, the Yad L'achim activists stood next to the missionaries, explaining to passerby exactly who they were, and discouraging them from accepting the materials offered. Once they heard who was trying to solicit them, nearly all passerby solicited by the missionaries walked away in disgust, leaving behind a verbal “souvenir” of their feelings (most of which are unsuitable for posting on Arutz Sheva). The missionaries demanded that the Yad L'achim activists desist from their activity, claiming that they had a legal right to solicit Jews to their cults unhindered. When the activists refused to move on, the missionaries called the police – but instead of finding relief, the missionaries were given a stern lecture by police about wasting their time. “In a democracy, anyone is free to say what they want – both you and them,” an officer told the missionaries. “In the future, please do not call us for issues like this.” Failure to heed their friendly advice, the officer said, could result in very negative consequences for them, he added. Yad L'achim activists expressed satisfaction at the results of their quick intervention, and urged Israelis to call them anytime, day or night, when observing missionary activities. “Where they are, we will be too, and we will make sure they fail in their efforts,” said one activist.